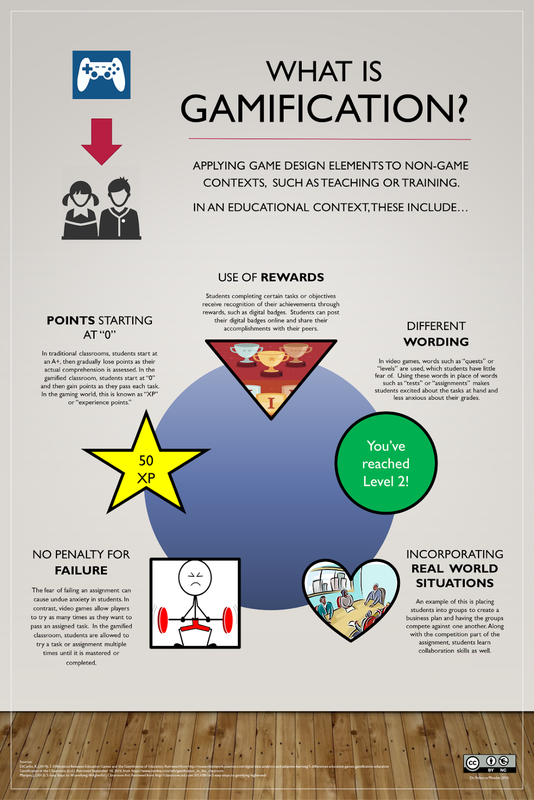 Recently, I created a poster about Gamification to place on the bulletin board outside of the my office. I designed it similar to that of an infographic and decided to post it here for whoever wants to use it. Note the Creative Commons License at the bottom of the page. For a larger version of the poster, feel free to email me. If I were to go back and work on the poster again, I would probably change a few of its features. First of all, I wouldn't have used so much text. Just a single sentence or two below each point would have worked. Also, the text is too small; I would have made it bigger. Secondly, I would have picked a more neutral background. Even though most of the infographic is fairly neutral as is, the floor part at the bottom is a bit distracting. Also, the pictures inside of the shapes are a bit distracting as well. I would have went with more basic shapes (maybe with some gradient) and not placed pictures inside of them with huge borders wrapped around the shapes. However, this was my first attempt at an infographic/education poster, so I applaud myself for even trying. After all, failing is a part of the gamification process, right? Any feedback for this infographic is welcomed as well.